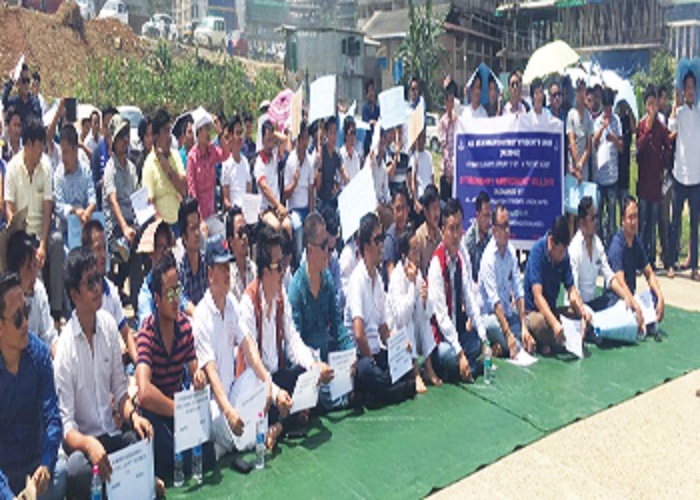 The All Arunachal Pradesh Students’ Union (AAPSU), which is a constituent of North East Students’ Organization (NESO), held its sit-in protest against the citizenship bill, at the tennis court near IG Park in Itanagar on Monday. The sit-in demonstration was joined by several district level organizations from across the State, student leaders and politicians. The protestors while expressing strong resentment against the bill demanded its cancellation. AAPSU general secretary Tobom Dai asserted that the union out-and-out rejects the bill. He termed the bill “anti-indigenous and anti-Northeast” and said it would, if implemented, have far-reaching ramifications in the State and the north-eastern region. Dai also informed that the AAPSU met with Chief Minister Pema Khandu last week and handed him a copy of the memorandum submitted to the Joint Parliamentary Committee (JPC) in Guwahati, and urged the state government to take a stand similar to the Meghalaya government. The students’ body also questioned the stoic silence maintained by the State Government on the burning issue. NESO coordinator Pritam Waii Sonam informed that the NESO along with its component units of apex student unions of the north-eastern states would meet Prime Minister Narendra Modi and all central ministers regarding the issue in its next phase of agitation. Former AAPSU general secretary Biru Nasi, whose executive body had opposed the bill when it was first introduced in 2016, exhorted the people of the State to stand united against the proposed bill. AAPSU president Hawa Bagang while addressing the protestors urged the people of the State not to encourage Chakma and Hajong refugees by employing them. He also sought deletion of Chakma and Hajong names that have allegedly been included illegally in the electoral rolls in some parts of the State. Representatives of several political parties, civil society organizations and NGOs also joined in the protest demonstration.